During the second half of the nineteenth century, few additions were made to the physical plant at Fort Norfolk. 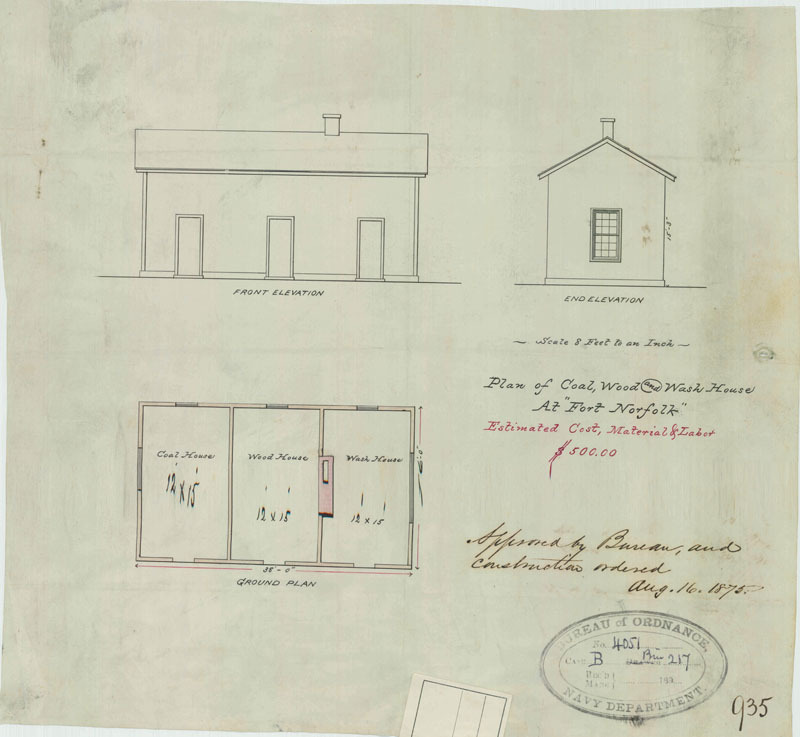 In 1875, a small structure described as a "coal, wood, and wash house" was added to the fort. The building had three separate rooms measuring 12 x 15 ft. to accommodate each of the three aforementioned functions (Bureau of Ordnance 1875) (see above). Immediately outside the bounds of the fort, the landscape was being radically altered. In the late 1870s, the Atlantic City Development Company sold off several house lots to the southeast of the fort. In 1890, the Atlantic City Company purchased a large portion of what had been, in the late eighteenth century, the land of William Poole. Robert B. Taylor and William E. Taylor conveyed the land that was situated immediately to the rear of the fort (Norfolk City Records, Deed Book 92:329). 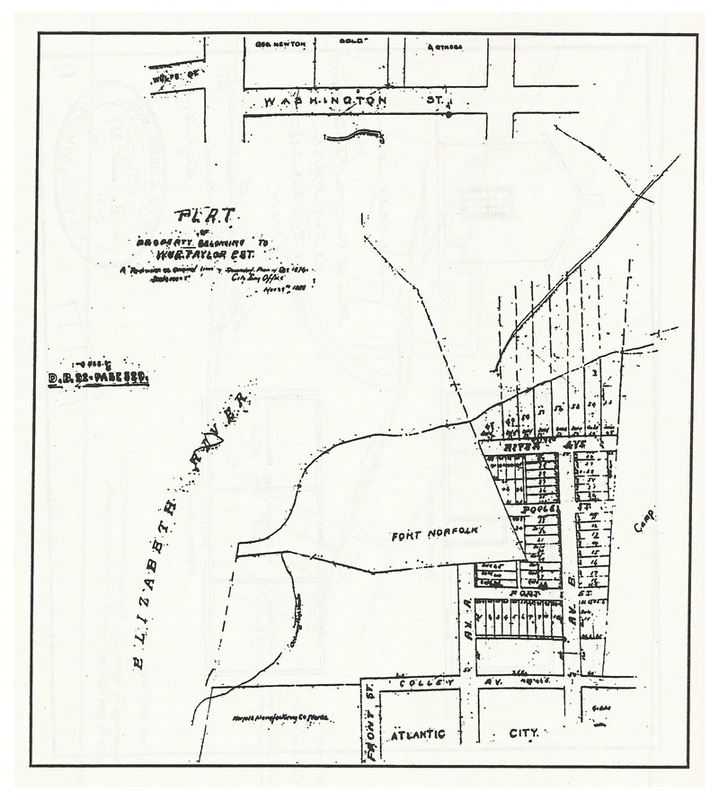 In late 1889, a plat was made of the land outside the fort showing the level of industrial and residential development (Norfolk City Records, Map Book 1:50-A) (see below). As the land around Fort Norfolk became more populated, Norfolk citizens grew increasingly concerned over the presence of large quantities of explosives in the midst of a growing neighborhood. In early 1880, the powder and live ammunition were removed from the fort. Henceforth, the Navy would store only empty shell casings and other non-explosive supplies at the facility. In April 1880, F. S. Taylor, acting on behalf of the Norfolk City Council, wrote to the Secretary of the Navy inquiring about the availability of the property now that the powder magazine had been removed. If the City of Norfolk owned the property, Taylor explained, the council could "offer inducements to certain Rail Road officials to make their terminus here." Taylor pleaded with the secretary to "ascertain, as quietly as you can, whether the Secretary of War or the proper official of the Government who has charge of the said property will dispose of the same" (ROCE Land Papers, Taylor to Goode, April 29, 1880). The property was not for sale, and Fort Norfolk would remain under the Navy's control for more than 40 years.